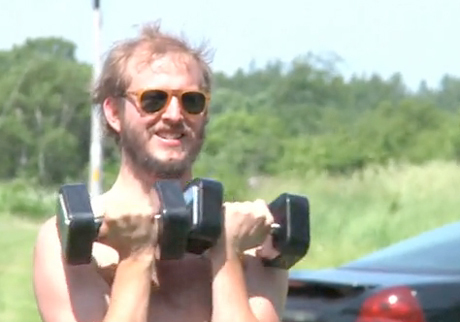 If you thought that recent clip of Bon Iver's Justin Vernon working out was pretty ridiculous, wait until you get a load of this. Apparently, the video, which features Vernon getting his sweat on with a personal trainer, is totally for real. In fact, it's going to be part of a for-real, feature-length workout DVD. Speaking with MTV Hive, director Dan Huiting (who's done music vids for Bon Iver tracks "Holocene" and "Calgary") revealed the film is called On the Road, which will be about 50 minutes long and feature music from Bon Iver and pals like S. Carey, Megafaun and We are the Willows. "It's like a workout mixtape. You can workout to cool music instead of something stupid," Huiting said. "If you're an indie rock kid and you put that music on while you're running on the treadmill, this is an actual circuit... It's in Justin's yard, where he grew up, and it's them doing these three circuit exercises. There's a dictionary where one person demonstrates a particular move that they're doing. It's legit. You can turn off the commentary if you just want to listen to the music." If that wasn't enough, Huiting is also working on a full-length Bon Iver documentary. Unfortunately, there's no release date for either film, but Huiting does say to expect the workout DVD "soon-ish." For now, you can watch the trailer to On the Road below. And not to rain on this parade, but when we're at the gym -- which, yes, does happen -- mellowed-out folky stuff like Bon Iver is probably the last thing we want to listen to.